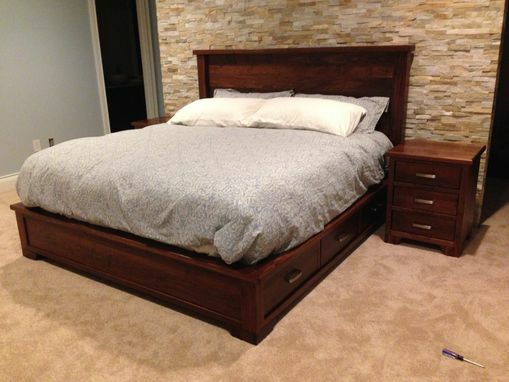 This solid walnut Bedroom Set was a collaborative design and experience between the customer & craftsman. 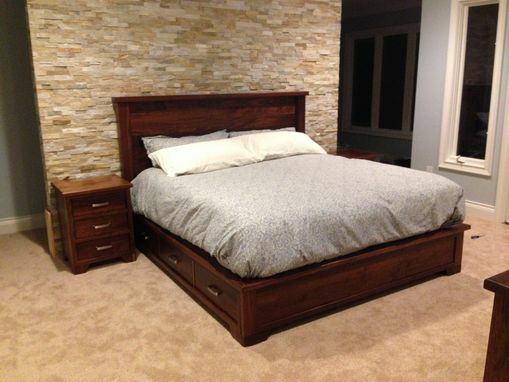 An initial meeting in the craftsman's wood shop helped to solidify the design and construction of all essential elements of the walnut Bedroom Set. 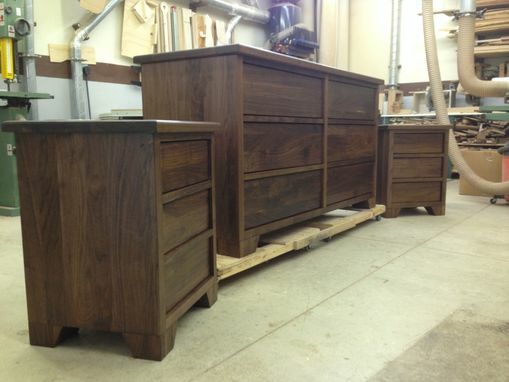 Also, the customer specified that the Bedroom Set would be made from predominately walnut heartwood, with little or no knots/blemishes in the grain pattern, or "wild" grain pattern. After minor design changes to the bed, it was decided that the bed had to be made to be assembled/disassembled on-site. Therefore, the "stand alone parts" of the bed are the headboard, the footboard, the 2 drawer rails, and the inner drawer support system. The customer specified a headboard made of 4" x 4" walnut posts with a solid 3/4" thick walnut panel (no walnut plywood was used) between the posts. The headboard is capped off with a 2" thick x 5" wide pc. of walnut. The bed rails were fitted with bed rail hardware sturdy enough to support the weight of the bed. An inner drawer support system was designed & constructed to guide/support the six (6) large drawers. Each drawer glides smoothly on 30" Blumotion undermount soft close drawer slides. The drawer fronts were inset to accommodate the drawer handles that project outward. Both the Dresser & Night Stands were constructed with similar construction as the Bed. 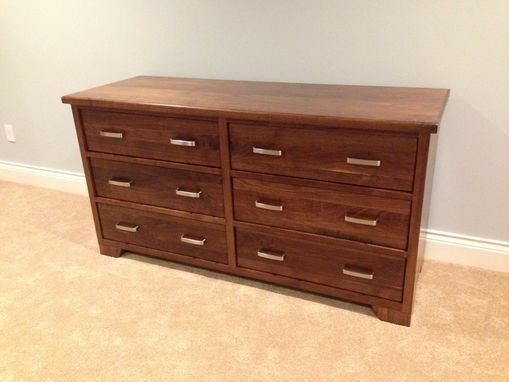 Drawer fronts were again inset to match the Bed and to accommodate the drawer handles. The drawers in the Dresser move on 18" Blumotion undermount soft close slides, while the drawers in the Night Stands move on 16" Blumotion undermount soft close slides. All pieces of the Bedroom Set were finished sanded, wiped down to remove all dust, and the surfaces coated with Watco's light walnut Danish oil. This helped to make the grain "pop," or stand out more. Once the Danish oil was dry, the 1st coat of the top coat, Arm R Seal, was applied. This was allowed to dry, hand sanded and wiped down to remove all dust, and a 2nd coat of Arm R Seal was applied. Finally a 3rd coat was applied in exactly the same manner as the 1st two coats.